Over 60 participants gathered for the 2nd annual VuStuff Conference at Falvey Memorial Library on Oct. 12 where four presenters highlighted the use of new technologies that make collections more accessible online. VuStuff, an annual conference that focuses on the intersections of technology and scholarly communication, is the brainchild of Darren Poley and Michael Foight, who both participated in an ad-hoc scholarly communication group formed by Shawn Martin at the University of Pennsylvania. Falvey’s professional librarians and technology staff continue to organize the conference each year. University Librarian Joe Lucia, in his welcome remarks, described VuStuff as the opportunity to “leverage the collective intellect” of libraries and to witness the “transformational energy of non-commercial players.” David Uspal, technology development specialist, emceed the event and encouraged focused group discussions over lunch. The range of topics covered this year included the digitization of rare collections, historical Pennsylvania mining maps and Catholic publications. Speakers Eric Lease Morgan, University of Notre Dame; Amy Baker Williams, University of Pittsburgh; Eric Zino, LYRASIS; and Rob Behary, Duquesne University, focused on the technical challenges they encountered, the fragile condition of historical materials and the economies and accessibility realized through digitization. Morgan, winner of the 2011 Vuie (or VuStuff) Award, presented on “VuFind and the ‘Catholic Portal'” and explained “how the Catholic Research Resources Alliance has exploited the open and modular nature of VuFind to implement” a portal to Catholic resources. Villanova organizers included Laura Bang, Alexandra Edwards, Jeffrey Eisenberg, Michael Foight, Mary Heyman, Regina McFadden, Darren Poley, Joanne Quinn, Stephen Spatz and David Uspal. 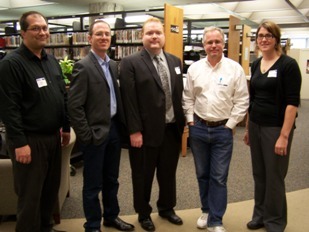 Look for a more detailed article about the event in Falvey Memorial Library’s “News From Falvey” newsletter in Spring 2012.